A boned leg of lamb makes a great centrepiece for the supper table. Buy your part-boned lamb from the Meat Service Counter and finish the boning yourself. Unwrap the lamb and remove the string, then lay the meat skin-side down. Make a vertical cut from the top of the joint into the middle of the leg and down towards the shank bone to open it up. Continue to cut along the length of the shank bone with short strokes to cut the meat away from the bone. Work carefully until you have totally cut the bone away. Remove the small knob of bone that lies below it. Trim the meat of any excess fat and cut down the length of the leg so that you can open the meat out flat. Slash any thicker bits with a knife for even cooking. Place all the marinade ingredients in a large bowl and mix. Then place the lamb in the bowl and rub with the marinade. Cover with clingfilm and chill, turning and coating the meat as frequently as possible, for at least 6 hours or up to 48 hours. 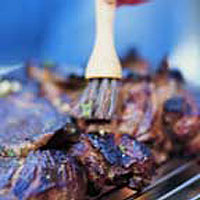 Prepare and light the barbecue (see Barbecue tips). Cook the lamb for 20 minutes on each side for rare meat, 25 minutes on each side for medium and 30 minutes on each side for well done, basting with the marinade occasionally. When cooked, remove and place in a dish, cover with foil and leave to rest in a warm place for 10 minutes. Transfer to a chopping board and carve into medium-thick slices. The lamb can be cooked in the oven at 180°C, gas mark 4 for 25 minutes per 500g, plus 10 minutes for medium meat. Light the barbecue about 45 minutes before you want to start cooking. It is ready when the flames have died down and the coals are glowing red under a thin layer of grey ash. (Pick up an Outdoor Eating and Food Safety leaflet in branch.) If you are using a gas barbecue, 10 minutes' preheating is sufficient.